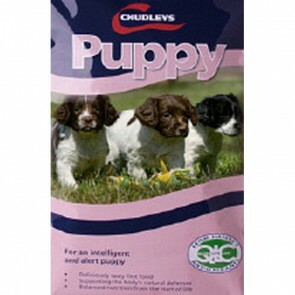 Chudleys dog food is produced by dodson and horrell a pet and feed supplier, that have been formulating dog foods, farm and horse feeds for over 35 years. Chudleys range of dry complete foods are free from artificial colours, flavours and preservatives, that have designed to provide your dog or puppy with a nutritionally balanced food, using high quality ingredients to help keep your dog healthy and active. 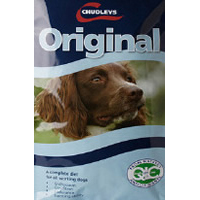 Within the range of chudleys complete dog foods, you will find a diet suitable for all dogs regardless of size or breed for each stage of your dog's life, for example working dog foods that are Vat Free, complete dog foods for pet owners, puppies, fussy eaters, overweight dogs and those with food allergies or sensitivities. Chudleys: 5 stars out of 5 based on 3 user reviews. I used to use a cheap brand of Biscuit from my local Supermarket which was not really ideal as it had 27% protein and also it had alot of different sugars in the mix, which is why my 2 greyhounds had soft runny stooles and they did pass alot wind all the time, that is why i spent an extra £3 on a bag of Chudleys Greyhound Mix since being on this their stooles are more what they should be i.e (not runny) and the gas has greatly reduced thank goodness, Greyhounds need 21% protein which is why i now feed them this Greyhound Mix as it is for resting or like mine retired from the Racing game, they will be on this all the time now. I have used this product (chudleysClassic) for two years now on my Rottweiler, and we have had no problems what-so-ever i find it just as good if not better than the more expensive brands of all in one food, and my rotty looks very on it as well, lovely coat. I would recomend people to at least try it.